Converse All Stars are to sneakers what Levi’s are to blue jeans: classic, durable and all-American. Long before Reebok, Puma, Nike, Pony, Adidas and Etonic bounded into our lives, there were the sneaker generations of Americans who grew up admiring as the standard in sports foot wear: Converse All Stars. The “Chuck Taylor” All Star shoe, with its canvas top and suction-cup sole, today seems an odd brother in a sneaker family of elegant leather and suede tops graceful rubber soles, cushioned silk linings and price tags that would make Kareem Abdul-Jabbar do a double take. Nevertheless, All Stars not only fathered these newcomers but can boast of being the last great American sneaker: More All Stars (over 550 million pairs as of 1997, ed.) have been sold over the years than any other model of footwear, and [until 2001 was] the last major sneaker still totally made in America. 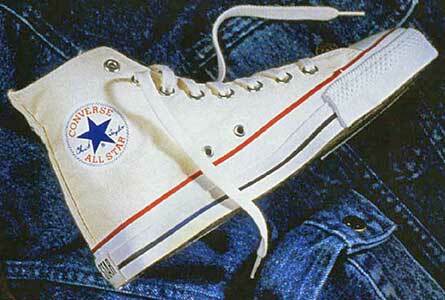 To my boyhood friends and me in the early 1970s, All Stars symbolized the ultimate in cool and daring footwear. We grew up in East Elmhurst, Queens, a proud, aspiring black community in New York City. To us, All Stars were an essential for basketball or street football, for impressing girls and for cutting a slick image. This was a time when we thrilled to a young basketball sensation named Julius Erving — the high-flying “Dr. J” — who appeared in ads for them. “Limousines for the feet,” they were dubbed. “Limos for the feet,” we repeated. Wearing a different type of sneaker was grounds for teasing, harassment, even ostracism. It was akin to wearing high-water pants. While improving our image, All Stars also allowed us to escape our relatively mundane world of schoolwork and street games and share a part of the glamorous world of Dr. J and pro sports. This made buying the sneakers something of an occasion. I sometimes spent months planning the purchase. I calculated the time it would take for my old Cons to wear out and, in the meantime, hustled odd jobs to earn the $12 needed to buy the sneakers. When the special day arrived, we would enter the cramped army-navy store and excitedly request All Stars. The fresh odor of rubber and canvas was perfume to our nostrils. Back then, the sneakers retailed only in black and white, high-top or low-top. There was no doubt in our minds that black was the coolest color; it didn’t take a genius to see that they needed less washing. Most people bought low-tops, but those of us who wore our sneakers through sun, rain and snow preferred high-tops. We wore only white laces, tied in a jazzy variety of vertical and horizontal lacings. After the purchase we would celebrate at a nearby pizza parlor. 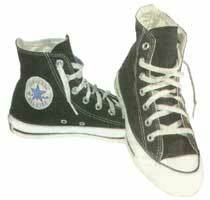 Converse introduced All Stars in 1916 and made a series of stylistic changes until 1936, when the shoe took on its current design. The sneaker derived its nickname from Chuck Taylor, a star forward from 1918 to 1938 for such teams as the Buffalo Germans and the New York Celtics, of the Amateur Athletic Union and the American League, respectively. Converse hired Taylor, and he would present a pair of All Stars to the best player on opposing teams. Roger House is a staff writer for The Providence Journal-Bulletin.